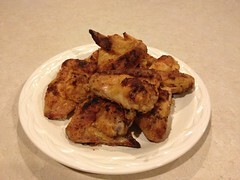 With football season upon us, I got a craving for some chicken wings. So on Sunday, after a full day at the soccer park, I picked up a large bag of drummies and headed home to put dinner together. 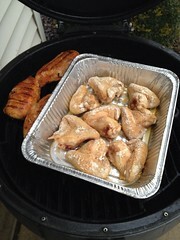 Cooking chicken wings isn't difficult, but landing on a flavor that you like takes a little experimentation. I like my chicken wings dusted with a generous amount of rub, grilled until slightly crisp, then tossed in a little BBQ sauce. I then toss them back on the grill to let the sauce caramelize. 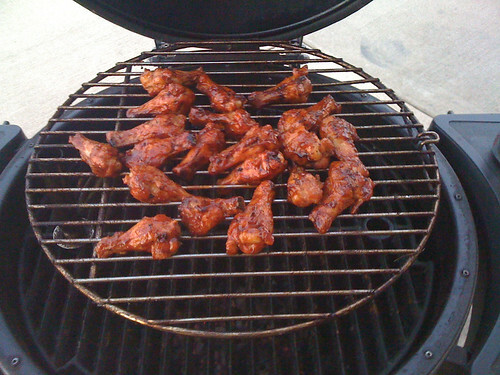 You can experiment to find the flavor that you like by trying different rubs and sauces, but here are a couple of tips to grilling chicken wings. Grill them over direct heat. I personally don't see any benefit in trying to do them low 'n slow. Start with a low temperature. You'll have the lid open a number of times to keep turning them, so your fire temp will creep up on its own. Use a pair of long tongs, but be careful that they're not too stiff. 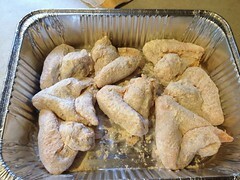 Turning a load of chicken wings over and over puts a lot of strain on your wrist. So, what's your favorite tailgating dish? Drop me a recipe in the comments below.